The Midlands UK delegation at MIPIM will be promoting over £11 billion of investment opportunities at more than 40 events. Sir John Peace, Chair of the Midlands Engine, will be joined by a range of senior keynote speakers who will be addressing the global investment community at MIPIM (Cannes, 12-15 March). They include Sir Edward Lister, Chair of Homes England; Melanie Leech CBE, Chief Executive of the British Property Federation; and Tony Pidgley CBE, Chair of Berkeley Group. High-profile speakers from the Midlands region include West Midlands Mayor Andy Street; Jon Collins, Leader of Nottingham City Council; and Cllr Ian Ward, Leader of Birmingham City Council. Female speakers will feature prominently this year, with the line-up including Elizabeth Fagan, Chair of the Derby and Nottingham Local Enterprise Partnership; Deborah Cadman OBE, Chief Executive of the West Midlands Combined Authority; Claudia Kenyatta, Director of Regional Delivery at Historic England; and Rachel Dickie, Head of Urban Regeneration at Legal & General. 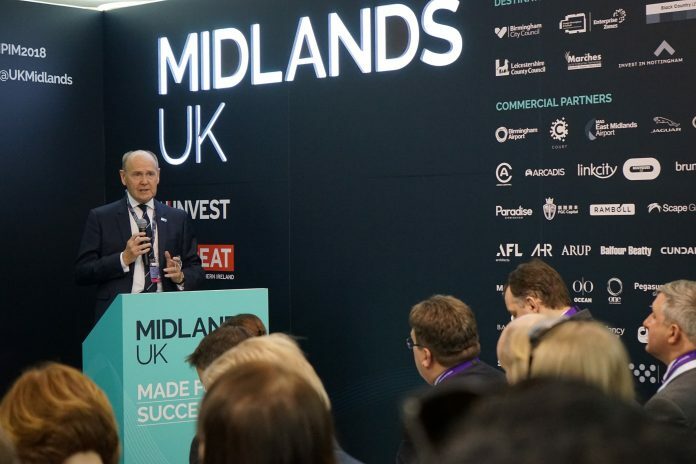 Sir John Peace said: “MIPIM provides a platform from which we can showcase the many strengths of the Midlands to a wide audience. Our economy, which has remained strong and resilient, presents a compelling offer to potential investors. Melanie Leech, Chief Executive, British Property Federation added: “MIPIM provides a unique opportunity to bring together senior decision makers from the private and public sectors, to discuss the issues and opportunities facing our industry. Panel discussions at the Midlands UK Pavilion will debate topics ranging from accelerated housing delivery to maintaining momentum in the office market and the importance of delivering inclusive growth. There will also be presentations highlighting major investment opportunities across all key real estate sectors – including residential, office & mixed use, life sciences, digital & creative, and manufacturing & logistics. John Forkin, Managing Director at Marketing Derby, said: “Marketing Derby’s mission is to raise the profile of Derby and Derbyshire in order to attract investment. “We have had a dedicated presence at MIPIM for over a decade and are enthusiastic supporters of the Midlands Pavilion. Public sector leaders will be joined by representatives from the private sector – including Birmingham Airport, Court Collaboration, Jaguar Land Rover, Lendlease and St Joseph. MIPIM hosts attendees from across the world. More than 26,000 delegates from 100 different countries take part, representing major investors, financial institutions, developers, the property industry and the media.